Today, several platforms offer eSignatures on a free or sliding scale. But while squiggly-line eSignatures move more quickly than manual contracting, clickthrough (or clickwrap) agreements are the quickest way to capture acceptance of contract terms. This helps enterprise businesses move and scale more quickly and provides better customer experience. A clickthrough (or clickwrap) agreement is a box or button users check or click to accept an online legal agreement in a check out or sign up flow. Companies can put any number of standardized agreements behind a clickthrough agreement and embrace high-velocity acceptance. “High velocity contract acceptance [is all about] maintaining transaction speed and providing a good customer experience by tailoring contract acceptance to the nuances of a business and its customers. Our preferences as consumers and businesses have changed so much over the last 15 years that speed and experience are no longer optional when it comes to most transactions — specifically buying experiences. eSignatures in their simplest form tend to break once businesses get a large volume of signers. To be more competitive, you need to be able to manage these increased volumes so you can function as a high-velocity enterprise. One of the more notorious bottlenecks in any agreement process is the actual contract. Especially for enterprise businesses, who have infamously long sales cycles. But using a clickthrough agreement can grease the wheels of your sales process and be a contract that people can read and accept wherever they are with modern signing methods. Clickthrough agreements are great for enterprise companies that want to improve their customer focus. PDFs are static, not data-driven, and are difficult to read on mobile. But most businesses send out their contracts using PDFs, which takes a longer time to accept. 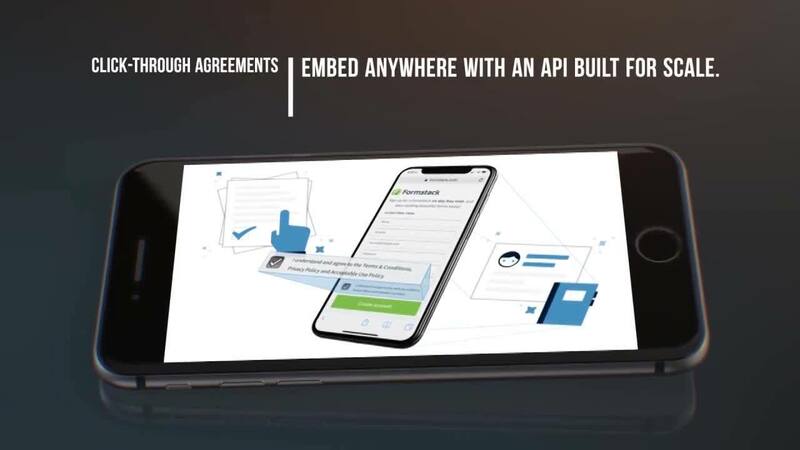 User experience is the core focus of the enterprise contracting experience, and a clickthrough agreement provides a seamless, single-step signing workflow for users—while also providing the data businesses need like tracking acceptance and the version that was accepted. Related: 3 reasons the PDF is bad for business. Using a clickthrough agreement, legal is better able to keep track of versions and signing records—which customer signed what agreement and when—across the entire enterprise. This is because a good clickthrough solution can hold all types of standardized agreements in one central location, giving legal way more control over agreements. This eliminates the added bottleneck of working through an engineering team to update online terms and track which users accepted to what version agreement. Whereas eSignature workflows are initiated by one person and have a multi-step workflow, clickthrough agreements can and will automate your agreements so you can send thousands of signatures in seconds. BMC moved to a purely digital business model and they were smart enough to make sure that their legal team was at the forefront of these changes. With the PactSafe platform, the company was able to define and implement an integration strategy across more than a dozen products and thousands of lead forms on BMC.com. With the flexibility of robust APIs, a central approach to storage and management of contracts, and a responsive support and implementation team, PactSafe has been implemented on more than 10,000 forms and in 14 products across the BMC enterprise—all with the ability for Legal to control their own changes to agreements without any code changes. Download the full BMC data sheet. Clickthrough agreements are legally enforceable if they follow best practices. When your business inevitably grows from your increased efficiency, clickthrough agreements can scale alongside your business. Best of all, clickthroughs allow you to manage and track your online legal terms—who signed them, what version, and when. While eSignatures allow your business to move faster than ink-and-paper contracting would, on its own it will not make your business more competitive in the B2B world. Clickthroughs, on the other hand, are a digital way of accepting legal terms that aligns with the self-service model that customers have come to expect. And in the age of digital transformation, it is impossible for your business to be more competitive without efficient, streamlined processes throughout your company, including contracting.